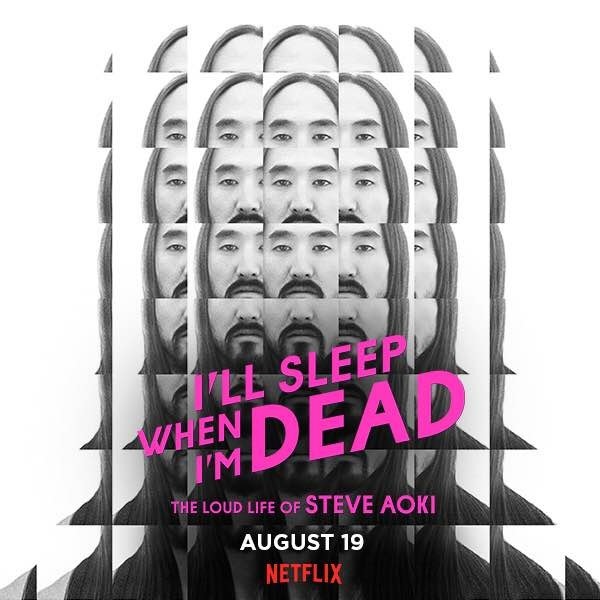 Fans of Grammy-nominated electronic music superstar, Steve Aoki, can now fully submerge themselves into the world of one of electronic music’s most traveled and best-known artists as his own documentary, I’ll Sleep When I’m Dead”, became available world-wide on August 19 via Netflix, the world’s leading internet TV network. Aoki’s story can now be seen in homes in over 190 countries world-wide, followed by a live Q&A at 12:30pm ET on Wednesday, August 24 moderated by iconic journalist Katie Couric at steveaoki.is/Facebook. Steve Aoki is a Grammy-nominated international producer/DJ, electronic dance music entrepreneur, and founder of the trendsetting record label, events/lifestyle company and apparel line Dim Mak. Since launching in 1996, Dim Mak has broken bands such as Bloc Party, The Bloody Beetroots, Klaxons, and The Gossip through deftly marketed single and full-length releases and now has nearly 500 releases to date. As a solo artist, Aoki has become one of the most traveled artists to date, averaging over 250 tour dates per year. Aoki’s second artist album, Neon Future I, was released September 30, 2014 via Dim Mak/Ultra Music and features his Gold certified single “Delirious (Boneless)” with Chris Lake and Tujamo featuring Kid Ink, “Born To Get Wild” featuring will.i.am and “Rage The Night Away” featuring Waka Flocka Flame. The second part of his Neon Future album, Neon Future II, was released on May 12, 2015 and features collaborations with Linkin Park, Matthew Koma, Snoop Lion, Rivers Cuomo and NERVO, plus a very special appearance by creative genius, J.J. Abrams, who voices the outro to close the album. Aoki’s other current tracks include “How Else” featuring Rich The Kid and iLoveMakonnen, “Back 2 U” with Boehm featuring WALK THE MOON–which has racked up over a million Spotify plays per week since its release in May and has been added to many Top 40 radio stations including Y100 in Miami-plus “Can’t Go Home” with Felix Jaehn featuring Adam Lambert. The film, which premiered to a sold-out audience at the Tribeca Film Festival this past spring, gives an inside look at the life of the international sensation, Steve Aoki, who stands as one of pop music’s most tireless multi-hyphenates: founder of the taste-making record label Dim Mak and a chart-topping producer/remixer/DJ with his finger pressed firmly to the pulse of cutting-edge youth culture. Vulnerable and often bittersweet, “I’ll Sleep When I’m Dead” was shot over the course of three years, during the making of his Neon Future double album (Dim Mak/Ultra Music, 2014/15). It follows his journey to play the biggest show of his career and centers around the complex yet loving relationship with his father, the Benihana restaurant tycoon, daredevil athlete, and former Olympian, Rocky Aoki. From the main stage of Tomorrowland in Belgium to intimate gatherings at his family home in Japan, it’s an inside look at one of music’s most outstanding characters. The story is complimented by interviews with Aoki’s beloved mother, sister/supermodel Devon Aoki, along with multiple big-name musicians and contemporaries including Diplo, Tiesto, Afrojack, Laidback Luke, Travis Barker, Pete Tong, will.i.am, and more. Be sure to catch Steve Aoki at one of his many upcoming international tour dates this fall and winter, which can be found at steveaoki.com.